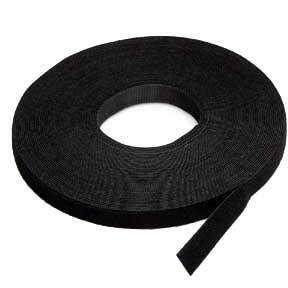 Ideal for use with Sporting goods, Toys and games, Medical devices, Wire harnesses and much more. Hook-and-Loop Wire Tie. Nylon strap for tying cable. 8 inches Length. Hook side instantly attaches to loop side. Easy to reopen and reclose. Color option: Black; Blue. Hook and Loop ties help you to arrange a number of wires and keep them together with the help of the Hook and Loop. You can easily put them even after the installation of the cables. It comes extremely handy while making external cable connections at home and office premises. You can choose from Hook and Loop straps of different lengths and widths, Hook and Loop strap tapes with different widths which can be cut and used accordingly, and hook and loop wire ties with loop. Quality is our first priority and hence we source products only from ISO 9001-2000 registered manufacturers. All products are RoHS compliant and environment friendly as well. Additionally, you get good after sales service and lifetime technical support on all our products.